In response to the recent backlash against Facebook’s latest privacy changes, Mark Zuckerberg announced yet more changes. Supposedly these changes make it simpler for users to set privacy controls. A summary of the changes follows. Go to Account –> Privacy Settings and you’ll see a summary of how you’ve set the controls. With one click you can change it. To see a screen shot, click on the image below. 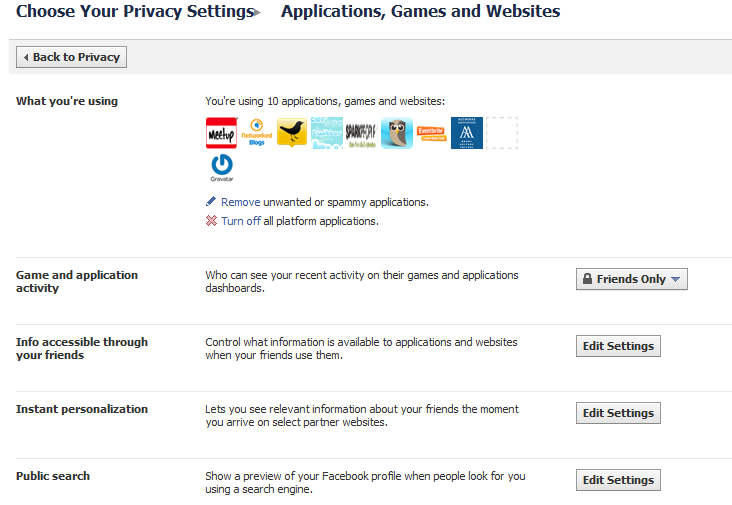 I’ve customized my settings, so certain information is visible only to friends and other information is private, e.g. email address. 2. Visibility of information you set will be the default for everything going forward. If you make your information visible to only your friends, then anything added later will also be visible to only your friends. No more default to visible to everyone. 3. You can now turn off all applications so none of your information is shared with applications or websites. Account — > Privacy Settings — > Applications. Application platforms can be totally turned off. 4. You can choose to NOT share information with partner websites. Previously, partner sites could access any information you’ve made available to everyone. Now, you have the ability to turn this feature off. You have do go in and manually uncheck the box, but this will insure (hopefully!) that no information is shared. 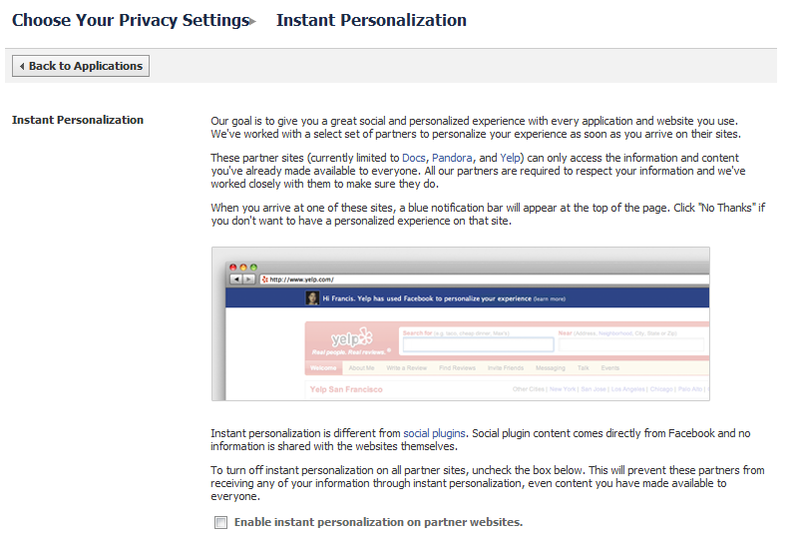 Account — > Privacy Settings — > Applications and Websites — > Instant personalization — > Edit settings. For more detailed information about Facebook Privacy controls, check out Facebook’s privacy explanation. You can also read more about it on Mark Zuckerberg’s latest 5/26/10 blog post. All this is well and good, but basic common sense still applies, be careful what you share online! Thanks for the post. It’s really useful! I’ll make sure to follow to the RSS from now on. @Jules – thanks for your comment. I’m glad you found the post helpful. I suppose I’m going to need to do some more research but this was a good place to start. @Marcia – thanks for your comments. I agree with you that Facebook’s privacy changes are confusing. I’m still learning more about them! @alex – hello yourself :). Greetings from the States! Zuckerberg can think what he likes but what I want is not more or less privacy per se, but the ability to select my privacy settings, to know who is viewing my blog, and to know what the privacy settings are on other posts that I comment on. I like being able to post something’s publicly but also keep other posts secluded to only my family or friends. @mike – thanks for sharing your thoughts about Facebook privacy. I agree with you that it should be up to each individual to be able to select his/her privacy settings. I believe that Facebook should have the defaults to be MORE private, rather than less. 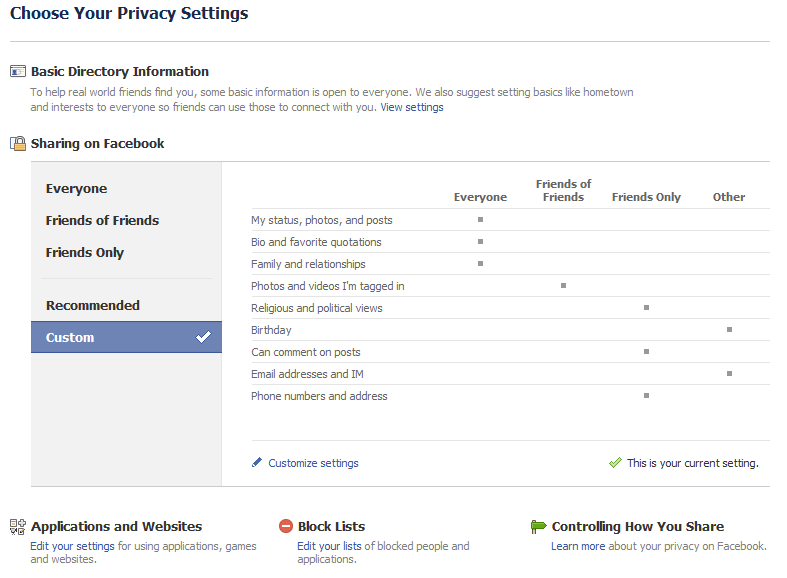 Facebook should also make the privacy section easier and simpler to navigate.